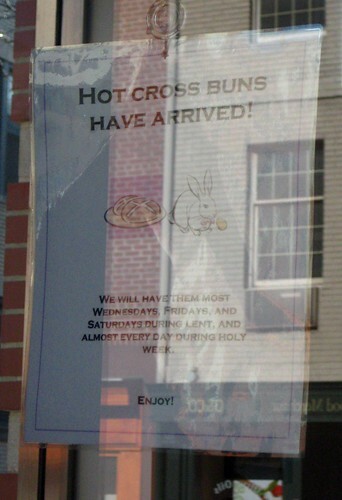 After all the cupcakes and cheese on Sunday, I found myself staring at the hot cross buns sign at Amy's Bread. I'd heard Brownie rave about these buns to no end, could they really be THAT good? 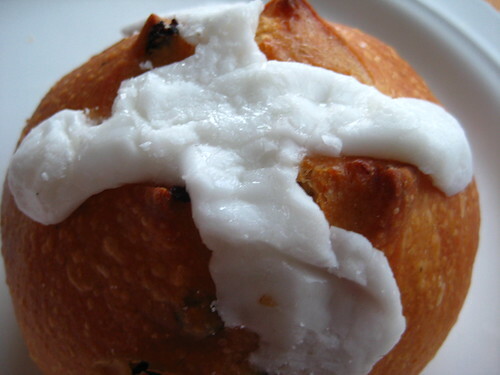 It's just a bun with some icing and currants, what's so awesome about that? Hot Cross Buns are a Lenten tradition, traditionally eaten on Good Friday. Amy's has them on Wednesdays, Fridays, and Saturdays during Lent, and then everyday during Holy Week. Brownie says these go fast, but I went late on Sunday afternoon and there were plenty to spare. Maybe they sell out during Holy Week? These are also baked in the traditional English way with currants embedded inside, as opposed to the more American candied citron. Seeing as my family only pretends to be Catholic on questionnaires, I didn't really know what to expect when I bought this $1.50 beauty. 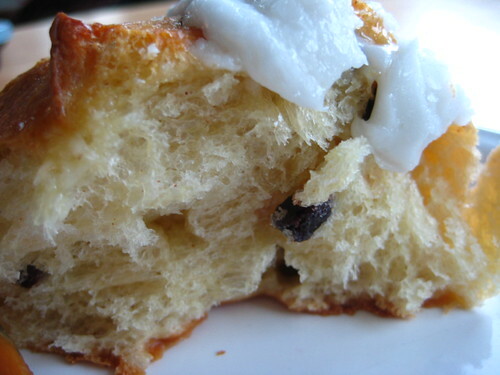 The vanilla icing was a bit too sugary, but I did like the sweet bread inside, it was fluffy and light. I could take or leave the currants, they didn't add much to my bun with their sweetness overwhelmed by the frosting. I would thoroughly enjoy this as a regular bun sans frosting and avec butter. This hot cross bun was bought at the Bleecker Street location of Amy's. That's not a *proper* hot cross bun! It shouldn't have icing on it (doesn't that make it a sort of Chelsea Bun?) it should have strips of baked, plain dough or just flour and water mixture. Gah. And you need to have them toasted with lots of butter in the middle! I think the dough on top is the way they do them in England. I've only seen them with icing and there are many bakeries in my area that sell them. Growing up in NJ we always had the little frosting cross on top. Maybe it's a tri-state area tradition? Whatever it is, I confess I love it but don't love the currants. But then again, most times I come across fruit pockets (as opposed to fillings) in baked goods, they are not a pleasant surprise.